Every business has a “Bean Counter”, and Julie Laumb is ours! 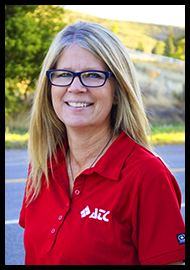 Julie has been with ATC since 1998 and works in our Albion office. As the head of our Accounting Department, Julie is skilled at keeping ATC’s ducks in a line. Although she enjoys spending her days pouring over numbers and balancing financial reports, her evenings are devoted to her family, reading, and boating. This witty, good-with-numbers, mother of three has a well-known love of potato chips…. but just don’t ask to use HER lawn mower! Julie is a natural born leader and mentor; we’re proud to have her on our ATC team.